Fuhrmann graduated from the U.S. Merchant Marine Academy in 1998 and sailed internationally for 10 years as a licensed engi- neering offcer. In 2008, he shifted focus shoreside consulting in dynamic positioning and marine operations, taking his current position with MAC as North American Operations Manager for Maritime Assurance & Consulting in 2014. A modest proposal that, during inevitable future market downturns, would help to give quality hulls a second life. I downturn. Much like industrial landflls, With narrowly focused industrial mis- functions in support of military sealift of imagination. Mexico and elsewhere are overfowing It is perhaps time that the same precy- alternate purposes as deemed necessary frst of three vessels with potential fur- with the remains of the boom market of cling philosophy is considered for appli- by market, political, or even social en- ther funding to increase to $365 million. the pre-2014 oil and gas sector. cation on a larger scale to marine assets. vironments including disaster response Likewise, with the support of local gov- having apparently outlived their use- activities and other missions with hu- ernment representatives the U.S. State fulness, these assets are left to the efects Past to Present – Recycling manitarian objectives. Maritime Academies have increased of rot and rust, unceremoniously stacked by Any Other Name ... This trend continues with current ef- eforts pushing for the funding of much and hidden from view like so much un- Vessels and rigs are generally not “re- forts at repurposing available assets for needed training vessels. In the general consumer market, the 2018, 43 vessels had been sold for scrap. of installation and maintenance includ- with less environmental impact than un- concept of precycling has been intro- That number is up a total of 153% from ing drill ship conversion projects for dertaking a newbuild approach. While duced in an efort to cut down the ev- the same period in 2017. This is a small wind farm installation functions. Like- this may very well be an arguable point, eryday trash humans produce. Briefy percentage of the 3,500 OSVs in the wise, companies are looking to fulfl the the potential economic benefts certainly speaking, this concept espouses the global market. Bearing in mind that ap- needs of the fshing industry with the justify consideration. 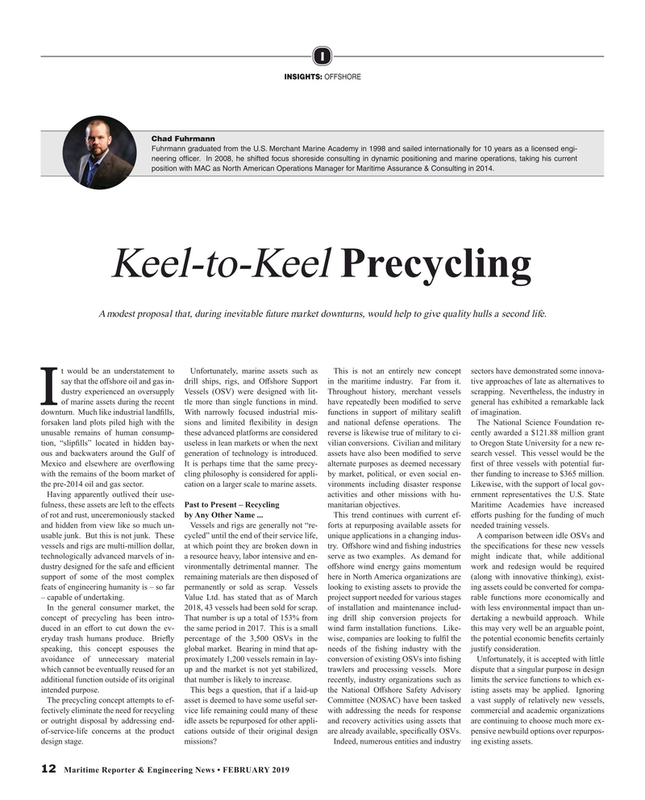 The precycling concept attempts to ef- asset is deemed to have some useful ser- Committee (NOSAC) have been tasked a vast supply of relatively new vessels, fectively eliminate the need for recycling vice life remaining could many of these with addressing the needs for response commercial and academic organizations or outright disposal by addressing end- idle assets be repurposed for other appli- and recovery activities using assets that are continuing to choose much more ex- of-service-life concerns at the product cations outside of their original design are already available, specifcally OSVs. pensive newbuild options over repurpos- design stage. missions? Indeed, numerous entities and industry ing existing assets.